Nike mainly competes with Adidas AG, Puma AG Rudolf Dassler Sport, Under Armour, Quicksilver and VF Knitwear in the sports apparel and accessories market. While Nike brand footwear is the single largest contributor to Nike's stock value (representing over 45% of its stock value by our estimates), Nike brand apparel still adds a healthy 25%. 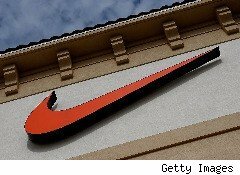 Nike's share in the sports apparel market has been gradually rising, and currently stands at about 4.5%. Given the size of the global sports apparel market, and Nike's focus on product innovation, we expect Nike's market share to rise beyond 6% by the end of our forecast period. Trefis members, however, project that market share will ultimately settle near 7.5%, implying 7% upside to our price estimate for Nike stock. We currently have a price estimate of $76.52 for NIKE's stock, in line with market price. Increased sports coverage in the media has played a large role in encouraging kids to play, which has a direct impact on sales of sports apparel. We believe that this trend will continue to spur new sales. Nike's 4% share of the $125 billion global sports apparel market is small compared to its 17% share of the worldwide athletic shoe market. However, the global sports apparel market is estimated to be twice the size of the global sports footwear market, so even a small share adds significant value to Nike's stock. Nike, with its strong R&D division, is uniquely positioned to gain in the sports apparel market. Nike has consistently emphasized style, comfort and performance of its apparel and has created great appeal through strong marketing and advertising campaigns. Nike markets and sells its apparel and footwear through similar channels, encouraging consumer to buy apparel and footwear together. We believe that there is a strong appeal for consumers to complement Nike footwear with Nike apparel. Trefis members forecast that market share for Nike brand apparel will increase from just over 4% in 2010 to over 7% by the end of our forecast period, compared to the baseline Trefis estimate of an increase to 6% during the same period. The member estimates imply an upside of 7% to our $76.52 price estimate for Nike stock.